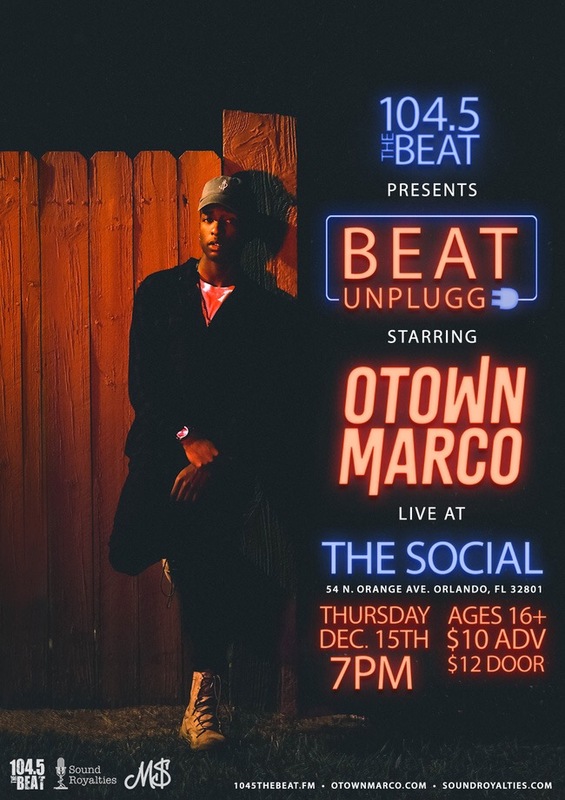 OFF THE BEAT: 1045 The Beat Presents #BeatUnplugged Starring Otown Marco at The Social December 15th. 1045 The Beat Presents BEAT Unplugged starring Otown Marco live at The Social. BEAT Unplugged is a new live concert series featuring cutting edge artists & bands performing eclectic renditions of their their recorded music. BEAT Unplugged will take place at The Social December 15th. The event is sponsored by Sound Royalties, a music investment firm dedicated to creating financial products & opportunities to help sustain the music community. Otown Marco is an American hip-hop artist from the westside of Orlando, FL known for his vivid lyricism, storytelling, clever wordplay, & musical prowess. Otown Marco most recently dropped a visual for his song “Blitz” & released a new Orlando anthem “Otown Reppin'” CLICK BELOW TO WATCH & LISTEN!